As the most influential British purveyors of combined musicianship and humour in the past 50 years, I was somewhat hesitant when I booked to see Three Bonzos and a Piano at the Landmark Theatre, Ilfracombe, North Devon on 25th June. Would they still have that magical spark of genius or would it be better to rely on listening to their recorded glory? A thorough drenching on the way there – it’s your fault, Glastonbury! – wasn’t an ideal start, but the arrival of Bonzos Roger Ruskin Spear, Rodney Slater and Sam Spoons, plus pianist Dave Glasson and guitarist Andy Roberts, soon had the audience and my clothes steaming. From the start, classic Bonzo numbers honked out of Rodney’s and Roger’s saxes – Cool Britannia, Jollity Farm, Hunting Tigers – and the compact but enthusiastic audience joined in without prompting. Roger Ruskin Spear, directing the proceedings in a manic, forgetful but totally entertaining manner, introduced his infamous electrified implements and robots on many of the songs. Reaching out into the audience as far as the mike lead would allow, he asked us the original questions preceding Shirt. Unbelievably, I got the chance to shout a right answer – I knew memorising those words would be more useful than my degree – and was awarded with a signed certificate, as were other studious participants. This was followed by a solo on the electric shirt collar, while Trouser Press featured the electric trouser press and the theremin leg appeared on Noises for the Leg. Across the stage Rodney Slater blew a mean sax, played washboard on Mr Slater’s Parrot and performed a mixture of new and old numbers, including Senior Moments and Ginger Geezer, the latter in tribute to the late Vivian Stanshall. Sam Spoons lived up to his name with several virtuoso performances on the spoons, including electric spoons on Monster Mash. A country and western performance of Purple Sprouting Broccoli also included the audience in a sing-a-long. As well as the three advertised Bonzos, we also got a free one: Vernon Dudley Bohay-Nowell. Uncle Vernon bewitched us with a stunning cabaret magic trick, held us spellbound with a children’s story and charmed us with an enchanting rendition of Marlene Dietrich’s Falling in Love Again, complete with solo on the musical saw. The audience got into the full spirit of the show and were in stitches most of the time, whether at Roger and Sam with their human ventriloquist act, when joining in the lyrics of Viv Stanshall’s Tent and Big Shot or from the hilarity of the Music for the Head Ballet. Organised mayhem ensured the whole show remained refreshingly rough at the edges, so that the evening flashed past in continuous laughter. 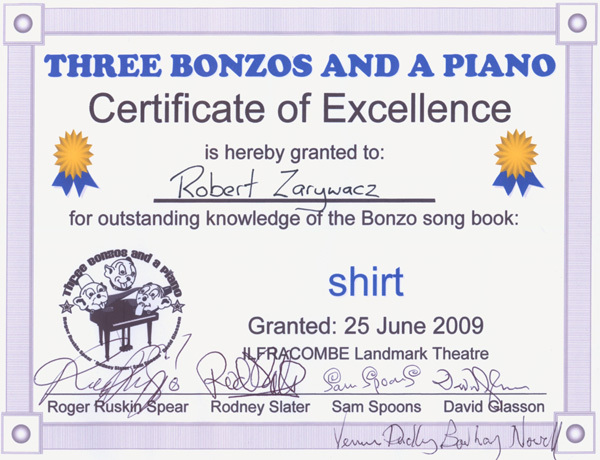 Three Bonzos and a Piano (33% extra free) should have packed out the Landmark because they were well worth seeing: I have the certificate to prove it. Go and see www.threebonzosandapiano.co.uk while they still perform – we’re all getting much older! Posted in music, books and writing. Tagged with Bonzo Dog Band, Ilfracombe, Landmark Theatre, North Devon, Rodney Slater, Roger Ruskin Spear, Sam Spoons, Vernon Dudley Bohay-Nowell. I would like to quote your review of the Three Bonzos And A Piano in the Doo Dah Diaries. (Vernon actually sung “Falling In Love Again” and not “Lili Marleen”. Yes, of course, be my guest. Thanks for spotting the error. Don’t know what I was thinking. Thanks for your generous comments on our show at Ilfracombe Landmark Theatre – we had a great time too. I have cheekily placed your blog on our website and a link to your website. Let me know if this is not ok.
You’re welcome. It was a great evening!